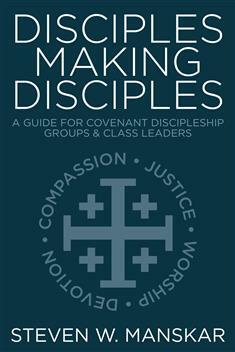 Disciples Making Disciples: Guide for Covenant Discipleship Groups and Class Leaders by Steven W. Manskar is for pastors, Covenant Discipleship group members, and class leaders. It provides information needed to organize the ministry, form groups, write a covenant, lead a meeting, support groups so they help the congregation live out its mission of making disciples for the transformation of the world. The book also describes the office of class leaders and how to introduce this powerful disciple-making office to the congregation. Take advantage of a discount and purchase all three Covenant Discipleship resources at once!